According to the Chinese State Council 2018 White Paper regarding religions in China, there are nearly 200 million believers, 5,500 religious groups and approximately 144,000 places of worship and religious activities. Furthermore, China is composed of 56 officially recognized ethnic groups. Jews or descendants of Jews, however, are not among them. In 1953, the authorities rejected a request to grant Kaifeng’s Jewish descendants a status of nationality due to their assimilation with the majority of the Chinese population. Today, according to the Jewish Virtual Library Database from 2016, there are approximately 2,600 Jews in China. The Jews who lived in China are responsible, for example, for some of Shanghai’s most iconic heritage architecture, including the Peace Hotel, the Cathay Theater and the Broadway Mansions. The Sassoon family, who built Shanghai’s Bund — the latter word, of Persian origin — along with the Hardoon family, real estate barons who held most of the buildings along Nanjing Road East, are just two the many notable Jewish families in Shanghai’s history . The establishment of the Sino-Israeli relations led to an entrance of various Jewish organizations into mainland China. Since the late 1990s, Chabad, an Orthodox Hasidic Jewish movement, has patiently built up its community structures, cooperating with local Jewish residents and the business community who live for a moment. Owing to a lack of Jewish patrons in China, many of its activities have been funded by industry, the Kosher industry in particular. The only remaining Jewish landmark, the Ohel Moshe Synagogue, which had been turned into a psychiatric hospital, reopened in 2007 as the Shanghai Jewish Refugees Museum. [See below left.] Initially, about 90% of the visitors were foreigners. However, lately, an increasing number of Chinese citizens have visited the museum, exploring the connections between Jews and Chinese. Beijing, which is home to a Jewish community of approximately 1,500, is set to make life in China easier for those who strictly observe the Jewish dietary laws of Kashrut. Previously, it was almost impossible to obtain genuine kosher milk in the city; importing a powdered substitute at a high cost from countries such as Australia and Israel. Today, under the supervision of Rabbi Shimon Freundlich, kosher certified milk is being produced at a local dairy and is available to all. Chabad supervises production at a 100% organic milk farm, to assure the kosher standard of the milk. In 2005, an Israeli organization called Shavei Israel arrived in China. The privately funded conservative religious organization, based in Jerusalem, specifically targets descendants of Jews who have lost their connection to the religion, such as those forced to convert to Catholicism during the Inquisition in Spain. As of 2011 the organization had helped 14 Jews move to Israel. However, Israel’s religious bureaucracy has prevented Shavei Israel from bringing over more of these Chinese Jews. Jewish organizations that have been active in China since the establishment of the official bilateral diplomatic relations include Chabads, the American Jewish Joint Distribution Committee (JDC), Kehilat Shanghai and Kehilat Beijing. The latter is supported by the World Union of Progressive Judaism. Those organizations often conduct events and conferences both for the local community and for Jews in general. For example, on 2013, nearly 200 Jews from Asia and across the world gathered in Shanghai for a four-day conference sponsored by Limmud China and the JDC. The conference focused on networking and the meaning of being Jewish in Asia. Israeli advocacy efforts have become far more pronounced. Israeli advocacy efforts have become far more pronounced. They have given way, for example, to the formation of a dedicated non-governmental organization (NGO), the Sino-Israel Global Network and Academic Leadership (SIGNAL). Established in 2011, SIGNAL’s mission is to help create “a broad-based academic framework that will foster long-term alliances between Israel and China.” SIGNAL is actually a by-product of collaborative efforts on the part of Jewish American organizations, with a degree of backing from the Israeli government. Beyond programs such as arranging strategic dialogues with Chinese think tanks and government organizations and arranging extensive country-wide lecture tours by Israeli or pro-Israeli speakers, SIGNAL is involved in promotion of Israeli and Jewish centers in China. Meanwhile, the Chinese government has been trying to shed light on China’s Jewish past in line with the improvement of Sino-Israeli relations. In Jews in China, author Guang Pan describes a series of exhibitions and events focusing on Jewish history in China from the late 1990s. For example, in June 1998, the Shanghai Municipal Government allocated funds for the renovation of the Ohel Rachel Synagogue building. The Jews of Shanghai are allowed to have religious ceremonies only three times a year. They continue to wait patiently for the day when they again might pray regularly in the Ohel Rachel Synagogue and re-establish the beautiful edifice as a center of Jewish life. The Chinese government has been trying to shed light on China’s Jewish past in line with the improvement of Sino-Israeli relations. 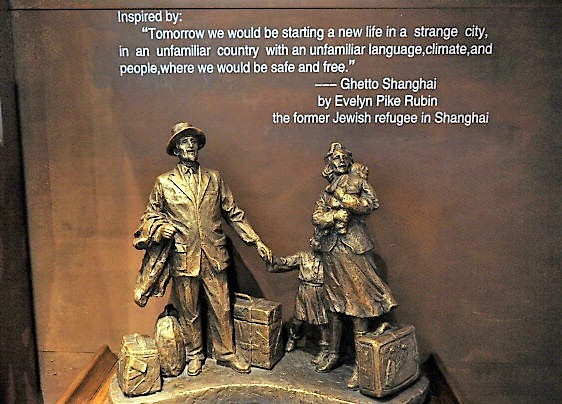 In August 1998, Rabbi Shalom Greenberg and his wife Dina arrived to Shanghai to serve the 150 Jews living in Shanghai. Today, the growth of the city’s Jewish population has brought the need for a larger community center to serve the needs of a flourishing Jewish institution. In 2004, Chabad Shanghai was able to purchase an impressive four-story building. This building houses a synagogue, mikveh, kindergarten, junior education facilities, a Sunday school, adult education classes and a lending library. The building also houses a kosher restaurant, a bakery, and a kosher shop supplying meat and poultry, wines and other packaged items. More recently, in October 2009, the State Council Information Office of China and Israeli Foreign Ministry jointly held an event named “Experience China in Israel” to depict relations between China and Israel. Later, in 2017, it sponsored a unique exhibition at Bar-Ilan University featuring the Jewish communities that used to live in China. Additionally, at least ten Chinese universities now offer Jewish Studies programs. Furthermore, China may want to have the support of the American Jewish community in managing and improving China’s crucial, but complex and oscillating relationship with the United States. According to a survey conducted by Salomon Wald, most Chinese people believe that the very strong Jewish Lobby in the United States can help maintain US-China relations on an even keel. Chinese representatives in the United States are seeking links with Jewish organizations, wooing American Jews in the hope of gaining some strategic leverage. These days, China discourages small population groups from seeking minority status, lest such efforts indirectly contribute to social instability. Of Kaifeng’s approximately 900,000 inhabitants, approximately 150,000 are Muslims. Kaifeng raises a policy conﬂict not only for the Chinese but for the local small community of Jews as well which consist approximately 1000 people. A New York Times article from 2016 reveals a tighter control over Jews in Kaifeng. Signs or Jewish historical presence have been erased. An inscribed stone marking the site of the old synagogue was removed from the front of a hospital that occupies the grounds, and workers buried the ancient well behind the hospital. All of this in order to remove the Jewish identity from Kaifeng. Except for a few scholars and intellectuals, most Chinese outside Kaifeng have not heard of the Jewish descendants in Kaifeng and their history. Chinese interest in Jews does not focus on Chinese Jews, but on Jews in general. Thus, China’s relations with the Islamic world can affect its policies towards Israel and Judaism. Since China depends on Arab countries’ oil and gas and hosts a large population of Muslim minorities, any formal policy in favor of Judaism might harm Chinese interests within the Muslim countries as well as might cause instabilities within the Chinese domestic Islamic groups. The perception of Jews in China continues to evolve in a positive direction. At the same time, the subject of Jews in China seems to be a matter of public, private, diplomatic and international debate. Today, non-Jewish members of Chinese society acquire their basic impression of Jews from material found on the internet and books. Chinese opinions of Jews are formed to a significant extent by Israel’s success as a high-tech exporter and as an innovative state. Furthermore, it seems that Jews are regarded as non-threatening. Jews were not accomplices in China’s “humiliation” by the West. Nor have Jews sought to colonize or make religious converts. The Chinese government’s interest in Judaism derives from political considerations, such as obtaining the support of the American Jewish community in order to gain influence over the United States and improve its own image as a safe place for Jews. Moreover, Beijing appears to recognize that a favorable disposition towards Judaism is the key to good relations with Israel, which in turn could facilitate bilateral cooperation on China’s Belt and Road Initiative (BRI) agenda as well as access to Israel's innovative technologies. It should be noted that both the Chinese government and Israeli NGOs are trying, each in its own manner, to influence the perception of Judaism. China draws a distinction between Judaism and the State of Israel, mainly for political reasons (i.e., to avoid damaging its relations with the Arab nations or even with its own Muslim minorities). Israeli NGOs in China, on the other hand, seek to emphasize the connection between Israel and Judaism, thereby linking improvements in Sino-Israeli relations with China’s approach to Judaism. The status and role of Judaism in China still has a long way to go. Any change in Chinese policy, if any, will occur gradually and must involve both Israeli and Chinese steps. China is still not a Jewish-friendly country in which to reside, mainly due to Chinese domestic policies and the fact that the Jewish community in the country is very small and has no political influence over Chinese decision makers. Moreover, the sensitivity regarding religions and ethnic groups in China will not ease the access of Judaism on Chinese soil. “China has nearly 200 mln religious believers: white paper,” Global Times, March 4, 2018, accessed April 4, 2018, http://www.globaltimes.cn/content/1096429.shtml. “Vital Statistics: Jewish Population of the World,” Jewish Virtual Library, accessed May 17, 2018, http://www.jewishvirtuallibrary.org/jewish-population-of-the-world. “China’s largest and oldest Jewish community is thriving,” Global Times, accessed April 6, 2018, http://www.globaltimes.cn/content/981579.shtml. M. Avrum Ehrlich, Jews and Judaism in Modern China (London: Routledge Jewish Studies Center, 2009) 65. Barbara Demick, “China’s Little Vienna,” Los Angeles Times, September 18, 2012, accessed April 4, 2018, http://articles.latimes.com/2012/sep/18/world/la-fg-china-jews-20120918. “Beijing becomes more kosher,” Global Times, February 23, 2010, accessed April 7, 2018, http://www.globaltimes.cn/content/507128.shtml. Bejamin Haas, “Chinese Jews feel more at home in Israel,” Los Angeles Times, October 16, 2011, accessed April 4, 2018, http://articles.latimes.com/2011/oct/16/world/la-fg-china-jews-20111016. Sam Sokol, “Asian Jewish leaders to meet in China,” Jerusalem Post, March 25, 2013, accessed March 23, 2018, http://www.jpost.com/Jewish-World/Jewish-News/Asian-Jewish-leaders-to-meet-in-China-307661. Mohammed Al-Sudairi, “An Israeli Lobby in China?” The Diplomat, April 30, 2015, accessed May 25, 2018, https://thediplomat.com/2015/04/an-israeli-lobby-in-china/. Guang Pan, (ed. ), The Jews in China (Beijing: China Intercontinental Press, 2015) 220-224. “Shanghai, China Jewish Community,” Jewish Times Asia, accessed April 5, 2018, http://www.jewishtimesasia.org/shanghai/262-shanghai-communities/46-shanghai-china-jewish-community. “Friendship between Chinese, Jewish people reflected in exhibition, Chinese historian,” People’s Daily, December 30, 2009, accessed April 8, 2018, http://en.people.cn/90001/90776/90883/6782553.html. Yaniv Pohoryles, “The Jews and the Chinese: A connection between ‘the world’s most ancient people,’” Ynet, February 2, 2017, accessed March 24, 2018, https://www.ynetnews.com/articles/0,7340,L-4924549,00.html. Benjamin Ivry, “Why Are the Chinese So Obsessed With the Jews?” The Forward, July 20, 2016, accessed March 24, 2018, https://forward.com/culture/344669/why-are-the-chinese-so-obsessed-with-the-jews/. Shalom Salomon Wald, “China and the Jewish People Old Civilizations in a New Era,” The Jewish People Policy Planning Institute (2004) 79, accessed May 25, 2018, http://jppi.org.il/uploads/China%20and%20the%20Jewish%20People.pdf. Chris Buckley, “Chinese Jews of Ancient Lineage Huddle Under Pressure,” The New York Times, September 25, 2016, accessed May 1, 2018, https://www.nytimes.com/2016/09/25/world/asia/china-kaifeng-jews.html.